North Korea and South Korea are never far from the news headlines - one for the alleged danger it poses to the world, the other for its apparent capitalist success story. 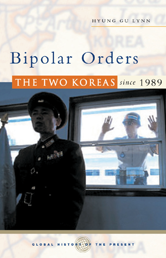 In Bipolar Orders, Hyung Gu Lynn analyzes the processes driving both countries since the 1980s. North Korea has experienced severe economic deterioration and increasing international isolation, while South Korea has undergone democratization and witnessed the emergence of a vibrant consumer culture. Paradoxically, this growing gap in ideologies and material standards has led to improved relations between the two countries. Why has this counterintuitive development occurred? Is North Korea really a threat, and if so, for whom? This book provides a substantive, accessible, and timely examination of the complex and compelling histories of the two Koreas.